Dr. Jordi Monés, Dr. Josep Badal, Dr. Marc Biarnés. FEEDER VESSEL LASER PHOTOCOAGULATION FOR IDIOPATHIC, SUBFOVEAL POLYPOIDAL CHOROIDAL VASCULOPATHY NOT RESPONDING TO EITHER ANTI-VASCULAR ENDOTHELIAL GROWTH FACTOR THERAPY OR PHOTODYNAMIC THERAPY. Retin Cases Brief Rep. 2016 Winter;10(1):100-3. doi: 10.1097/ICB.0000000000000174. To describe the management of a subfoveal polypoidal choroidal vasculopathy case refractory to antiangiogenic treatment and to photodynamic therapy. Case report. 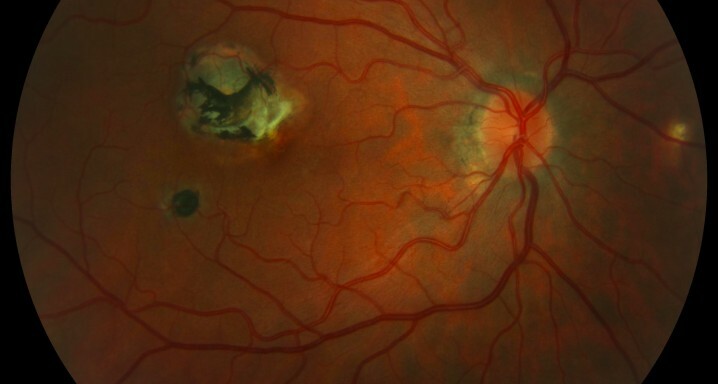 A 65-year-old male patient presented with a diagnosis of exudative age-related macular degeneration of his left eye and unsuccessful response to eight antiangiogenic injections. Visual acuity was 20/33. Fluorescein angiography, spectral domain optical coherence tomography, and indocyanine green angiography confirmed the diagnosis of polypoidal choroidal vasculopathy. Two photodynamic therapy sessions along with two ranibizumab injections were performed, but no response was obtained. Identification and photocoagulation of the polyp feeder vessels was performed. Polypoidal structures regressed, intraretinal and subretinal exudation resolved, and visual acuity was preserved with no adverse events. Indocyanine green angiography-guided feeder vessel diode laser photocoagulation in selected cases of polypoidal choroidal vasculopathy may be considered an effective alternative therapy, especially in those refractory to both photodynamic therapy and antiangiogenic therapy.